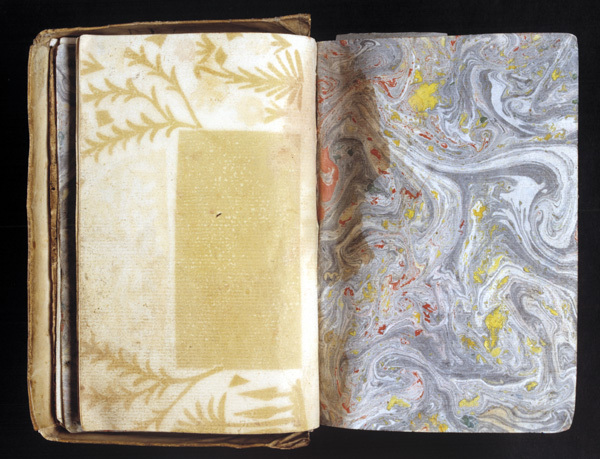 Marbled paper is called in Turkish ebru after a Persian world for 'cloud' - the Turkish marble reminds of clouds drifting in the sky. The art of marbling probably originates in China. It was practised in 13th century Turkestan and was fully developed in 15th century Persia and Turkey, where artistry reached great heights in the 16th century. 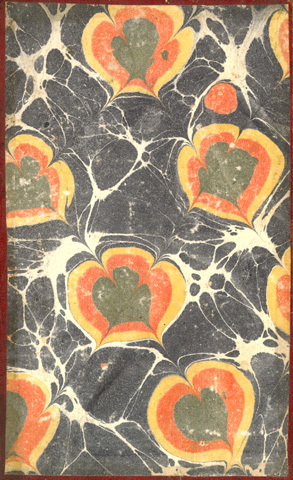 Marbled paper was used for poetry and other calligraphy, as 'security paper' to prevent illicit change in the text, later also as endpapers and book covers. 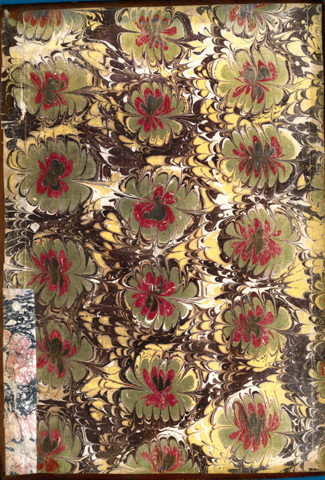 In the 16th century, the art of marbling became known in Europe, where it arose great fascination, and where these papers were likewise initially used as decorative inserts in the so-called Album Amicorum, popular at the time, later principally as bookbinding material. Marbling consists of depositing colours upon a watery surface, a size, that has been made thick through the addition of a starchy substance, earlier gum tragacanth. The colour is mixed with a chemical substance, mainly ox gall, which causes them to expand into thin films and keeps them from commingling with one another. A pattern can be fashioned with the finger, a needle, a comb or otherwise, after which a sheet of paper is laid on the surface to absorb the pattern. 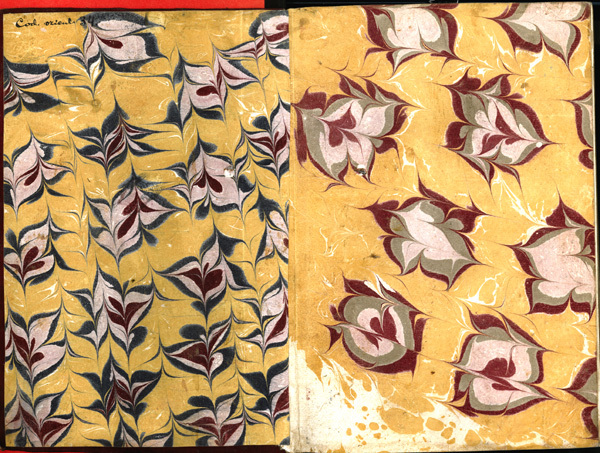 Specific Turkish patterns: hatip-ebrûsu (specimen), a flower pattern named after Mehmet Efendi (d. 1773), marbler and preacher (hatip) in the Aya Sofia mosque; lâle-ebrûsu, "tulip paper" (specimen), the most difficult within the art of marbling. 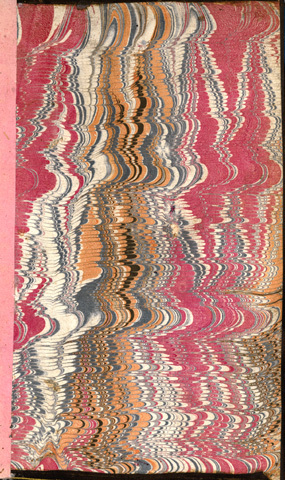 Some specimens of mainly marbled end- and cover papers, mostly from Hedenborg's collection. "Paste marbling" has nothing in common with 'Turkish' marble but is a European technique. 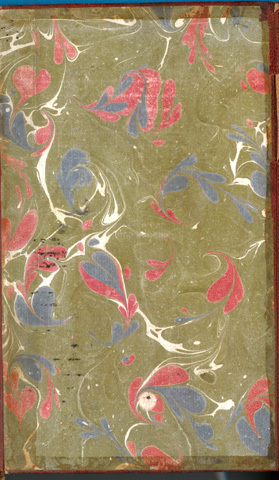 The paper is covered with paste colour in which the pattern is created. One variant is effected by sprinkling colour mixed with ox gall or soap spirit on the hanging paste-covered paper so that rills appear. Another type op pattern was printed with paste colours from woodblocks (specimen), a third method was colouring with stencils. Paste paper was easy to manufacture and was often used for bookbinding. Silhouette papers (specimen) have Persian origin, were developed by the Turks and became much esteemed by European travellers. The silhouette pattern was cut out from thin pieces of leather, soaked in colour and assembled on the side of the paper, the other half of the sheet was brought down over it and the whole assembly was subjected to pressure. Thus the pattern appears twice with one mirror image. The sheet was then brushed with an egg white solution and polished with a smooth stone to give it the washed appearance typical of Oriental paper. 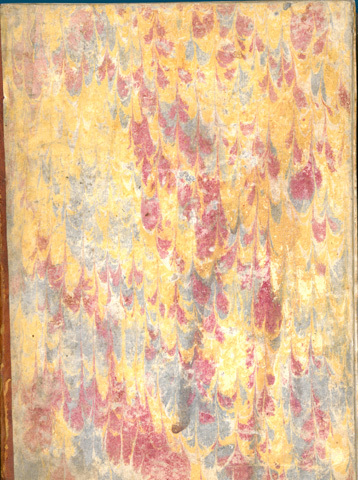 Sheets of silhouette and marbled papers from an Album Amicorum, Prague 1600. The marble is certainly European, the silhouette paper probably Turkish. 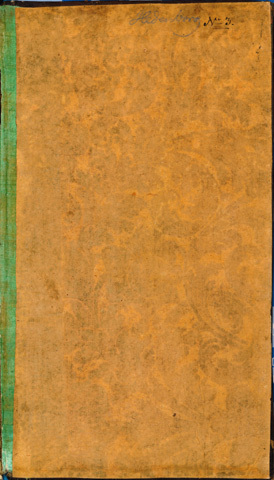 Wolfe, R., Marbled paper : its history, techniques, and patterns. Philadelphia 1990.